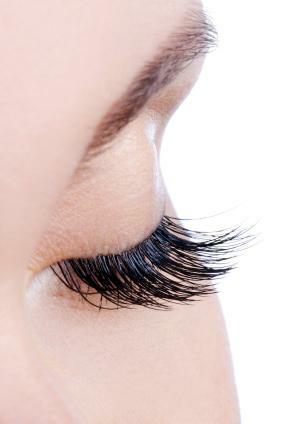 There are many reasons a woman might want to wear glueless false eyelashes. If your lashes are sparse, these makeup accessories are easy enough to apply for everyday wear. On the other hand, if you just want a little extra "oomph" for that special occasion, self-adhesive lashes can add some glamor to your eye makeup. Start with a clean eyelid without makeup. With the lashes still in their plastic tray, stand in front of a mirror and hold the tray in front of your face about halfway up your nose. The lashes should fan out away from your face as they would during actual wear. Slowly lower the tray down to the counter. Do not turn the tray. The lash on the left goes on your left eye and the lash on the right goes on your right eye. Remove the first lash from the plastic packaging. Be careful to only touch the adhesive strip until necessary to avoid making the lashes lose their stickiness. Use a pair of tweezers and hold the lash close to your lid, but do not touch the sticky edge to the lid just yet. Look at the adhesive strip edge. Does it match the width of your own eyelid or do you need to trim it? If it is longer, trim it down to size using a small pair of embroidery scissors. Trim just a few hairs at a time until the strip is the size you need. Close the eye on which you are placing the false eyelash strip. Place the edge of the strip right up to where your natural lash line starts. However, be careful not to put the sticky edge directly on your own lashes or removal will be painful. Once the lashes are applied, complete your eye makeup as normal. Use an eyeliner in the same color as your lashes and smudge a line of color up against the fake lash to blend your natural lash and false lashes together and create a more natural look. Reviews on sites like Makeup Alley and Amazon offer both good and bad reviews on various brands of self-adhesive false lashes. When it comes to self-adhesive versus lashes that are glued on, there seem to be both pros and cons. You'll have to weigh both and decide which type is best for your makeup needs. Fortunately, removing self-adhesive lashes is fairly simple. When you are ready to remove the false lashes, start with eye makeup remover. Dip a cotton swap into the bottle of eye makeup remover and then run the swab over the line of the false lash. Allow to sit for a few minutes so the adhesive will weaken. Gently grasp one end of the strip with your fingers. Slowly pull the strip straight out from your lid. If you feel pulling on your lashes, stop and use a cotton ball soaked in baby oil to loosen the adhesive and then continue to pull gently until the strip is loosened. Once the lash strip is removed from your eye, go ahead and pull the adhesive from the back of the fake lash. The lash is now ready to be cleaned and worn on another day. If you are just entering the world of fake lashes or want a quick and simple way to apply them for a special night, the glueless method of applying false eyelashes might be right for you.